The Ireland team pictured ahead of the Wales game. LAST NIGHT’S LOSS to Wales has left Ireland almost assured of relegation in their Nations League group. Denmark now just need a point in their final two games against either Wales or Ireland to ensure the Boys in Green are consigned to bottom place and relegation to League C.
UNL Pot: The four teams who qualify for the Nations League finals (i.e. the winners of each group in League A (see teams below). League A teams: 1. France (7 points) 2. Spain (6 points) 3. Belgium (6 points) 4. Portugal (6 points) 5. Switzerland (6 points) 6. England (4 points) 7. Italy (4 points). 8. Netherlands (3 points). 9. Poland (1 point). 10. Germany (1 point) 11. Croatia (1 point) 12. Iceland (0 points). League B teams: 13. Bosnia and Herzegovina (9 points) 14. Ukraine (9 points) 15. Russia (7 points) 16. Wales (6 points) 17. Denmark (4 points) 18. Austria (3 points) 19. Czech Republic (3 points) 20. Turkey (3 points). 21. Sweden (1 point) 22. Ireland (1 point) 23. Slovakia (0 points) 24. Northern Ireland (0 points). So what happens from there? There are 10 Euro 2020 qualifying groups. The teams who finish in the top two in each group qualify automatically. These will account for 20 of the 24 teams that will qualify for the tournament. The remaining four spots will be decided by a series of Nations League play-offs. Theoretically, the teams that qualify automatically for Euro 2020 could be anyone. But in reality, they are likely to be mainly teams near the top end of the Nations League. The play-offs for the four remaining Euro 2020 spots will feature 16 teams that have not qualified automatically. The Nations League group winners will qualify automatically for this stage. However, if a group winner has already qualified, they will be replaced by the next-best ranked team in the same league. Four teams from each league will compete in the play-offs (though this might not be possible in some cases, e.g. if more than eight teams from League A qualify automatically for the Euros). The group winners in each league qualify automatically, but will be discounted if they have already qualified for the Euros through the normal route. The same then applies to the second-place teams. So there are eight spots reserved in the play-offs for teams in League A and B.
Let’s hypothetically assume the rankings stay as they are currently. If France, Spain, Belgium, Portugal, Switzerland, England, Italy, Netherlands, Poland, Germany, Croatia, Iceland, Denmark and Wales qualify via the normal route, Ireland will be one of the eight sides who advance to the play-offs regardless of how they perform in the Euro 2020 group qualifiers. If the situation got worse and Ireland slipped below Slovakia and Northern Ireland in the overall rankings, they could still qualify if, for example, Czech Republic and Turkey qualify via the normal route in addition to the aforementioned teams. So basically, assuming Ireland lose all their Euro 2020 qualifiers and also finish 24th (the lowest they can possibly finish in the overall Nations League rankings), they will still advance to the Nations League play-offs if 16 teams above them in the overall Nations League rankings qualify for the Euros via the normal route. If Ireland finish in their current overall position of 22nd, they would still qualify for the play-offs if 14 of the teams ranked above them qualify automatically for the Euros. They could yet finish slightly higher in the overall rankings, which is why even next month’s clash with Denmark should not be written off as a complete ‘dead rubber,’ even though Ireland will more than likely finish bottom of their group regardless of that match’s outcome — a win in Copenhagen could conceivably be the difference between advancing to the Nations League play-offs and missing out on Euro 2020. So what do these play-offs actually involve? The 16 teams involved in the play-offs will be divided into four paths with one qualifying spot awarded to the team who prevails in each of these paths. The 12 matches will take place between 26 and 31 March, 2020. In each of these paths, there will be semi-finals and a final. In the semis, the best-ranked team will face the fourth best-ranked team and the second best-ranked team will face the third best-ranked team. Nations League group winners cannot face teams from a higher league, so for example, assuming someone like Georgia top their Nations League group and fail to qualify automatically for the Euros, they are likely to have an easier pathway in the play-offs than a team like Ireland would. Email “How Ireland could lose all of their Euro 2020 group qualifiers and still qualify for Euro 2020”. 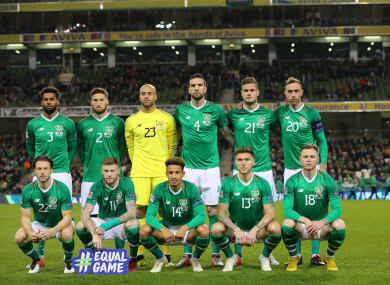 Feedback on “How Ireland could lose all of their Euro 2020 group qualifiers and still qualify for Euro 2020”.